The Canadian Journal of Neurological Sciences (CJNS) is a widely circulated, internationally recognized medical journal that publishes peer-reviewed articles in neurology and neurosciences. Articles are published in English with abstracts in both English and French. The Journal is published in January, March, May, July, September, and November in an online format. 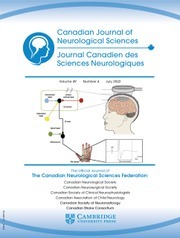 The Journal is the official publication of the five member societies of the Canadian Neurological Sciences Federation (CNSF) -- Canadian Neurological Society (CNS), Canadian Association of Child Neurology (CACN), Canadian Neurosurgical Society (CNSS), Canadian Society of Clinical Neurophysiologists (CSCN) and the Canadian Society of Neuroradiology (CSNR).